Paper details the largest randomised control trial of the effectiveness of drug Atezolizumab in metastatic bladder cancer in a second-line setting. A leading bladder cancer researcher has co-authored a paper detailing the largest randomised control trial of the effectiveness of drug Atezolizumab in metastatic bladder cancer in a second-line setting. 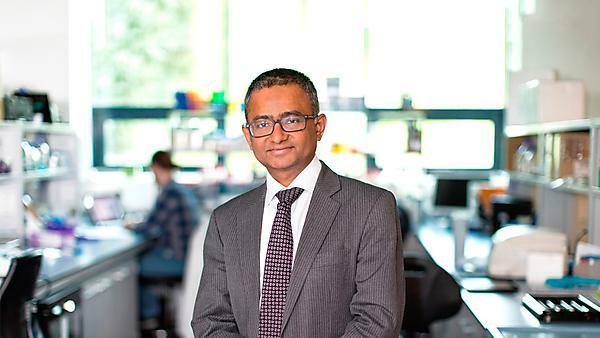 Professor Syed Hussain, Chair in Oncology in Plymouth University Peninsula Schools of Medicine and Dentistry, was one of only two UK investigators on the study, published in 'The Lancet'. The multinational study compared the drug’s effectiveness versus chemotherapy in 900 patients over 128 different sites and, although negative overall, showed a subset of patients living longer as a result of the drug. Professor Husain’s latest paper in ‘The Lancet’ (doi: 10.1016/S0140-6736(17)33297-X) follows his previous paper, which showed that patients in a second-line setting who took a combination of existing and experimental drugs – known as docetaxel and ramucirumab respectively – had a delay in disease progression. This is compared with those who took the existing drug docetaxel with a placebo. The combination stopped new blood vessels from forming, effectively starving the cancer, and results showed that the addition of the experimental drug slowed down the progression of the tumour from approximately two to four months.